Vijaya Bank has been providing banking services in India for 80+ long years and is one of the very few banks which makes the usage of new technology in providing both security & services. The bank has recently entered into social media with its new social media marketing initiative program. At an event held at Bangalore, MD & CEO Kishore Sansi said, ” The social media foray also opens up an avenue for us to touch base with youngsters at an early age, including banking habits, expose them to the financial world & also to egg them on to a less-cash society”. He also added, today i.e., June 29th is going to be a historical moment & the new initiative will help us to be close with nation-wide customers. After addressing the gathering, Sri Kishore Sansi posted the very first tweet & a Facebook video to the official social media handlers. As of now, the corporate bank has started their official pages on Facebook, Twitter, LinkedIn, Instagram, and YouTube. With this launch, the bank can have a real-time communication with the customers & solve their queries fastly. He also quoted, this is just a beginning of our new era & with the feedback from the customers, we will make sure the services we are offering will surely benefit them. Along with the MD & CEO Sri Kishore Sansi, other delegates from the top management of the bank has also attended the social media marketing initiative event & shared their opinions. 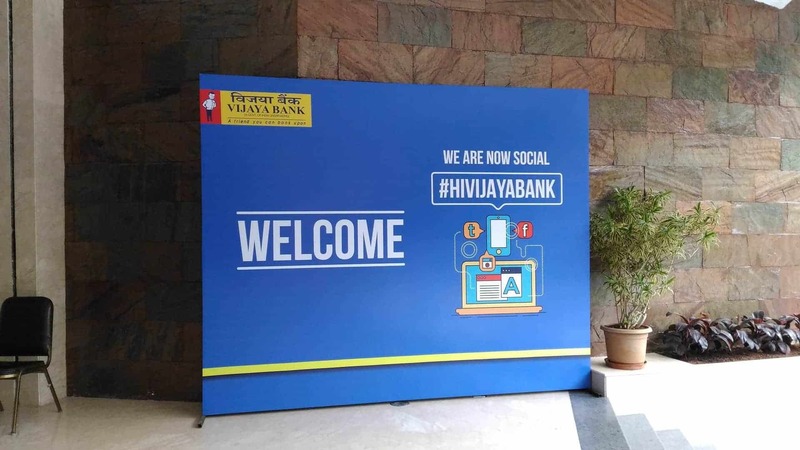 During the launch, the hashtag #HiVijayaBank was one of the top trending hashtags on Twitter from India, and just after the official launch of handles the customers started engaging on their social media channels, especially on their official Facebook & Twitter. The below is the official event cover up from one of our team members! Share your opinions in the comment section about this new social media marketing initiative by Vijaya bank.